"Emirates Airline" and "Emirates Air line" redirect here. For the cable car in London, see Emirates Air Line (cable car). Emirates (Arabic: طَيَران الإمارات‎ DMG: Ṭayarān Al-Imārāt) is an airline based in Dubai, United Arab Emirates. The airline is a subsidiary of The Emirates Group, which is wholly owned by the government of Dubai's Investment Corporation of Dubai. It is the largest airline in the Middle East, operating over 3,600 flights per week from its hub at Dubai International Airport, to more than 150 cities in 80 countries across six continents. Cargo activities are undertaken by Emirates SkyCargo. Emirates is the world's fourth largest airline in scheduled revenue passenger-kilometers flown, the fourth-largest in terms of international passengers carried, and the second-largest in terms of freight tonne kilometers flown. From March 2016 to February 2017 Emirates had the longest non-stop commercial flight from Dubai to Auckland. During the mid-1980s, Gulf Air began to cut back its services to Dubai. As a result, Emirates was conceived in March 1985 with backing from Dubai's royal family, with Pakistan International Airlines providing two of the airline's first aircraft on wet-lease. With $10 million in start-up capital it was required to operate independently of government subsidy. Pakistan International Airlines provided training facilities to Emirates' cabin crew at its academy. The airline was headed by Ahmed bin Saeed Al Maktoum, the airline's present chairman. In the years following its founding, the airline expanded both its fleet and its destinations. 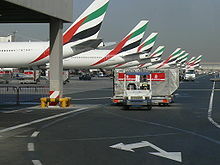 In October 2008, Emirates moved all operations at Dubai International Airport to Terminal 3. Emirates operates a mixed fleet of Airbus and Boeing wide-body aircraft and is one of the few airlines to operate an all-wide-body aircraft fleet (while excluding Emirates Executive). As of February 2019[update], Emirates is the largest Airbus A380 operator with 109 aircraft in service and a further 14 on order. Since its introduction, the Airbus A380 has become an integral part of the Emirates fleet, especially on long-haul high-traffic routes. Emirates is also the world's largest Boeing 777 operator with 151 aircraft in service. The airline is a subsidiary of The Emirates Group, which itself is a subsidiary of the Dubai government's investment company, Investment Corporation of Dubai. The airline has recorded a profit every year, except the second year, and the growth has never fallen below 20% a year. In its first 11 years, it doubled in size every 3.5 years, and has every four years since. In 2015 Emirates paid dividends worth AED2.6 billion (US$708 million), compared to AED1 billion (US$272 million) in 2014. The government has received Dhs14.6 billion from Emirates since dividends started being paid in 1999 for having provided an initial start-up capital of US$10 million and an additional investment of about US$80 million at the time of the airline's inception. The Dubai government is the sole owner of the company. However, it does not put any new money into it, nor does it interfere with running the airline. Emirates has diversified into related industries and sectors, including airport services, engineering, catering, and tour operator operations. Emirates has seven subsidiaries and its parent company has more than 50. The company employed a total of 38,797 staff at the end of the fiscal year on 31 March 2011. Its parent company, The Emirates Group, employed a total of 50,000 employees of which 10,785 were cabin crew, 2,237 were flight deck crew, 1,904 were in engineering, and 9,084 were listed as other. Emirates provides its employees with benefits such as comprehensive health plans and paid maternity and sick leave. Another strategy employed by Emirates is to use profit sharing and merit pay as part of its competency based approach to performance management. Emirates has stated that its versions of the A380-800 will offer fuel economy of 3.1 litres per 100 passenger km. In the financial year 2014–15, Emirates generated revenues of around AED 89 billion ($24.2 billion), which represented an increase of approximately 7.5% over the previous year's revenues of AED 83 billion. Passenger numbers also increased from 44.5 million to 49.2 million over the same period representing an increase of around 11%. Passenger seat factor increased by 0.2% to 79.6%. Cargo carried in 2014-15 also improved, by 5.6% to 2.4 million tonnes (2014–15: 2.25 million tonnes). The airline's profits for the 2014/15 fiscal year rose by 38.3% to AED 5,893 million ($1.25 billion) on the back of the lower oil prices and strong US dollar, although the 80-day runway closure at Dubai International negatively affected results. Its parent company saw profits up 34% to $1.5 billion for the year to 31 March. As of March 2015, Emirates did not use fuel price hedging. Fuel was 34.6% of total costs, and employee related costs were 14.3% of total costs. Emirates' financial success has been attributed to rapid growth in demand for air travel in the Middle East, Africa, and Asia; the airline's investment in state-of-the-art aircraft, and the availability of airport capacity that can be used 24 hours a day. In the 1990s, Emirates launched its first set of commercials with the slogan So be good to yourself, Fly Emirates. In 1999, it launched a very rare A330-200 launch commercial with different pictures showing its aircraft with the original logo and the current logo (which was launched a few months before). Commercials have reappeared in 2002, though the airline would not adopt the slogan Fly Emirates. Keep Discovering until 2004. In 2008, Emirates launched a slogan mainly revolving around its route network of 100 destinations in 59+ countries across six continents – Fly Emirates. Keep Discovering and Fly Emirates. To over Six Continents. Emirates currently uses the slogan Fly Better. Emirates introduced a new design in August 2008 for its 16,000 uniformed staff, designed by Simon Jersey. 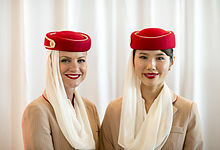 The offboard uniform includes the Emirates hat, red kick-pleats in the skirts, more fitted blouses and the return of red leather shoes and handbags. For the onboard uniform, male and female cabin crew wear service waistcoats in place of the previously worn service jackets and tabards. The male flight attendants wear a chocolate brown suit, featuring pinstripes, with a cream shirt and a caramel, honey and red tie. Both male and female pursers wear this chocolate brown color, but with no red featured. Since its formation in 1985, though to a limited extent until all aircraft were repainted, Emirates aeroplanes carried a section of the United Arab Emirates flag on the tail fins, a calligraphy of the logo in Arabic on the engines and the "Emirates" logo on the fuselage both in Arabic and English. The colour scheme used since 1985 was changed in November 1999 to the one still in use today. This change saw the modification of logotype, the enlargement and move of the English logo (the Arabic remaining smaller) towards the front of the aircraft and a different, flowing flag on the tailfin. In 2011, Emirates sponsored the Emirates Air Line cable car over the River Thames in East London. Since 2015, Emirates has sponsored the England-based Spinnaker Tower in Portsmouth, on the south coast . The airline did have £3.5m worth of plans to paint the landmark red, but after some discussion with the residents of Portsmouth and Southsea, Emirates agreed the tower was to be coloured blue and gold, with red lettering of the Emirates sponsor , for the pure reason that Portsmouth F.C. (the local football team) is coloured blue. It is now named "Emirates Spinnaker Tower". Emirates sponsors Cricket Australia, Lord's Taverners, and Pro Arch Tournament. Its branding also features on international cricket umpires shirts. Emirates has also become an official partner of the International Cricket Council until 2015. This deal gives Emirates association with all major ICC tournaments, including the 2011 and 2015 ICC Cricket World Cups, ICC Champions Trophy and ICC World Twenty20. Emirates is the Twenty20 shirt sponsor of Durham County Cricket Club and hold the naming rights to the Riverside Ground, now known as Emirates Durham International Cricket Ground, as well as the naming rights to the Emirates Old Trafford Cricket Ground, and is the shirt sponsor of Lancashire County Cricket Club. Emirates were also the major sponsor of the Kings XI Punjab (Season 2,3 and 4) and Deccan Chargers (Season 5) and Rajasthan Royals (Season 11) teams of Indian Premier League, the largest domestic cricket tournament in the world. 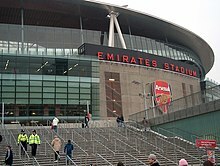 Emirates Stadium in London, home ground of Arsenal F.C. Emirates Airlines was also a sponsor of FIFA and the FIFA World Cup, but stopped its sponsorship in early 2015, due to allegations of corruption and bribery within FIFA, as well as FIFA's questionable decision to award the 2022 FIFA World Cup to Qatar. Since the 2006–07 season, it has been the primary shirt sponsor of Arsenal, Hamburger SV and Paris Saint-Germain as well as AC Milan since the 2010–11 season, Real Madrid since the 2013–14 season and Benfica since the 2015–16 season It is also the primary shirt sponsor of the New York Cosmos. Emirates is also the title sponsor of the FA Cup, Emirates Cup and Arsenal's Emirates Stadium. It was the primary shirt sponsor of Chelsea from August 2001 until May 2005. In August 2009 the Scottish Junior Football Association announced that Emirates would sponsor its Scottish Cup competition. Emirates is the sponsor of AFC travel and play, in AFC Champions League and AFF Suzuki Cup. Since 2014 Emirates Airline has been the sponsor of Super League Rugby League team, the Warrington Wolves. It is a multi-year sponsorship and the cost has been touted as around £5m. Since 2015, Emirates Airlines is also the sponsor of Super Rugby South African team the Lions as well as having the naming rights of the team and Ellis Park rugby stadium. It is also the main sponsor of USA Rugby. Emirates is the sponsor for the World Rugby panel of international referees. In horse racing, Emirates sponsors the Dubai International Racing Carnival. It sponsored the Australian Turf Club's Autumn and Spring Carnival until 2011, and the Melbourne Cup Carnival from 2003 until 2017. Emirates is the major sponsor of the Emirates Team New Zealand, winners of the 35th America's Cup in sailing. Emirates was also a sponsor of British Formula One team McLaren in the 2006 season. It is also the Formula One official airline sponsor since 2013 season. Emirates is a main sponsor at the Japanese Grand Prix from 2016. Since the 2012 season, Emirates has sponsored the US Open Series, a six-week summer tennis season leading up to the US Open. Its sponsorship runs until 2019. Emirates also sponsors Collingwood Football Club in the Australian Football League, and FC Dallas in Major League Soccer. Since the 2016 season, Emirates is the official airline of the Los Angeles Dodgers of MLB. Since 2017 Emirates is the sponsor of the UAE Team Emirates -former Team Lampre-Mérida- which is a UCI World Tour Team. Since 2015, Jennifer Aniston has starred in two commercials for the company. In May 2015, Emirates operated over 3,000 flights every week across its network of over 140 destinations in over 70 countries across six continents from its hub in Dubai. As of September 2018, Emirates’ global network spanned 161 destinations in 85 countries. Emirates is not a member of any of the three global airline alliances – Oneworld, SkyTeam or Star Alliance. In 2000 the airline briefly considered joining Star Alliance, but opted to remain independent. The reasoning for this was later revealed by senior vice-president of the airline's commercial operations worldwide that, "Your ability to react in the marketplace is hindered because you need a consensus from your alliance partners". Emirates codeshares with the following airlines: Sometime in December 2017, the Tunisian authorities said that they will suspend Emirates flights to Tunis. Emirates SkyCargo is the air freight division of Emirates. It began operations in October 1985, the same year Emirates was formed, and launched its own aircraft services in 2001 with a Boeing 747 Freighter. It serves 10 exclusive cargo destinations, besides others in common with the Emirates passenger network. Emirates Executive was launched in 2013 for corporate and private charters. It operates a single Airbus ACJ319 business jet, accommodating 19 people. It features a mix of private suites and seating, a lounge, dining area and bathrooms with full height showers. As of August 2018, Emirates operates a fleet of more than 250 aircraft. Emirates operates the largest fleets of Airbus A380s and Boeing 777s in the world, with one A319 as an executive jet. Emirates has had no narrow-body aircraft in its mainline fleet since 1995. In July 2014, Emirates finalized an order for 150 Boeing 777X aircraft, consisting of 35 777-8s and 115 777-9s, and, as of October 2017[update], was expected to become the launch operator for the 777X in mid-2020. In November 2017, it signed a commitment for 40 787-10s, but by early 2019 it was considering cancelling this order due to engine margins being insufficient for the hot Dubai weather, in favour of the A350. The current livery features a UAE flag on the vertical stabilizer and a white fuseliage, with the golden word "Emirates" painted on the upper fuselage. The Emirates logo is painted gold on all engines and most A380s feature the Expo 2020 logo near the nose. The former livery of Emirates was the same as the current one, except that the font was Times New Roman and it was relatively smaller, located on the top of the windows. There was also the Arabic company name painted. All aircraft wearing the old livery were repainted or retired. There are two types of first class seating; the fully enclosed suite with a ceiling to floor door and a private suite with doors that close but don’t extend to the ceiling. Both suites come complete with closing doors to ensure privacy, a mini-bar, a coat rack and storage. They also feature the ICE system on a 23-inch-wide (58 cm) LCD screen in the private suites and a 32-inch-wide (81 cm) on the fully enclosed suite. The seat converts into a 2-metre-long (79 in) fully flat bed. Private suites are available on 3-class Airbus A380-800, all Boeing 777-200LR and 3-class Boeing 777-300ER aircraft. The fully enclosed suites are available on its newly delivered Boeing 777-300ER aircraft. On its newly delivered Airbus A380-800, First class features private suites, two shower-equipped lavatories and spa, and access to the first/business class bar area and lounge. Premium class seating is located on the entire upper deck of A380-800 aircraft. Emirates introduced a new First Class cabin for its Boeing 777-300ER fleet on 12 November 2017  and first flight to Brussels and Geneva on 1 December 2017. The new First Class cabin is configured with six suites on a 1-1-1 layout. The middle suites come with virtual windows that project live feed from the outside of the aircraft on real time. Both the middle suites are equipped with 3 virtual windows which are high definition LCD screens which relay real time image using the HD cameras on either side of the aircraft. Amenities include 2 minibars placed on either side of the entertainment screen, a 13inch tablet with a front camera to communicate with the cabin crew and to order room service. A panel to control the lighting and temperature inside the suite. Emirates has also introduced a new seat in collaboration with Mercedes-Benz, which feature a new zero-gravity position. The suites are expected to resemble "a private bedroom on a luxury yacht". 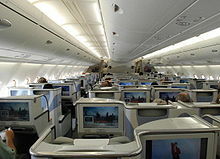 Business class on Boeing 777-200LRs and Boeing 777-300ERs feature seats with a 1.5-metre-long (60 in) pitch that recline to 2-metre-long (79 in), angled lie-flat beds. Amenities include massage function, privacy partition, winged headrest with six-way movement, two individual reading lights and an overhead light per seat, in-seat power supply, USB Ports and an RCA socket for laptop connection, over 600 channels of entertainment on ICE, shown on a 17 in-wide (43 cm) TV screen. On Airbus A380-800 aircraft, the seats recline to form a fully flat bed and are equipped with personal mini-bars. Due to the unique staggered layout, half of the business class seats on Emirates A380 are 23 cm (9 in) shorter than the others, at only 1.8 m (70 in) long. Business class passengers also have access to an on-board bar at the rear of the aircraft. Emirates Economy class offers a 79–81-centimetre-long (31–32 in) seat pitch on Airbus aircraft and 86 cm (34 in) on Boeing aircraft and standard seat width (except on the Boeing 777 fleet). Emirates has ten seats per row on its Boeing 777 fleet. The seat features adjustable headrests, a 3000 channel ICE In-Flight-Entertainment and in-seat laptop power-outlets on newer aircraft and laptop recharging facilities in galleys in older aircraft. There is additional recline on A380 Economy class seats. An appetiser served in Business Class on Emirates. 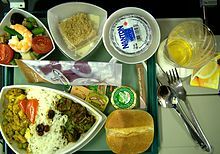 Catering on Emirates flights from Dubai International is provided by Emirates Flight Catering which operates one of the largest airline catering facilities in the world. Emirates also offers special meal options, in all classes, based on age, dietary restrictions, preference and religious observance. Special meals must be ordered in advance, at least 24 hours before the flight departure time. Halal meals, however, do not need to be booked as they are part of the normal meal. Emirates became one of the first group of airlines in the world to introduce a personal entertainment system on a commercial aircraft in 1992, shortly after Virgin Atlantic introduced a similar system throughout the cabins of its aircraft in 1991. All three classes feature a personal in-flight entertainment (IFE) system on Emirates aircraft. There are two types of entertainment system on Emirates: ICE and ICE Digital Widescreen. 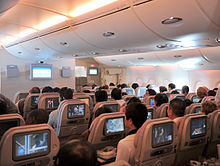 In 2012, Emirates introduced larger high definition IFE screens in all classes. The new IFE is the first to be fully high definition, and in economy, the screens are the largest offered by any airline. The new IFE will only be installed on the Airbus A380 fleet and the newly delivered Boeing 777's. ICE (Information, Communication, Entertainment) is the in-flight entertainment system operated by Emirates. Introduced in 2003, ICE is available on all new aircraft and now features 4,000 channels (on most flights) to all passengers. ICE is found on the airline’s Airbus A380-800, Boeing 777-200LR, Boeing 777-300 and Boeing 777-300ER. In July 2007, Emirates introduced ICE Digital Widescreen, an updated version of ICE. It offered over 1200 channels of pre-selected entertainment available to all passengers. ICE Digital Widescreen is available on all new aircraft. In 2015 Emirates upgraded its ICE - inflight entertaining system to the new eX3 system which includes new upgrades that improved passenger experience, such as Handset with more controls, larger screens, new sockets, some 3,500 channels of movies, TV shows, music and games, on demand and in multiple languages, new ICE features, such as a Voyager app, Bluetooth audio and personal video playback. This is fitted in 2009 onward aircraft B777 and A380 as well as installed on new aircraft that will be delivered to the airline. The system is based on the 3000i system from Panasonic Avionics Corporation. ICE provides passengers with a direct data link to BBC News. ICE is the first IFE system to be connected directly to automatic news updates. This is complemented by ICE's Airshow moving-map software from Rockwell Collins. Exterior cameras located on the aircraft can be viewed by any passenger, through the IFE system, during takeoff, cruise and landing. Emirates was also one of the first airlines to introduce high-speed, in-flight Internet service along with Singapore Airlines, by installing the Inmarsat’s satellite system and became the second airline in the world to offer live international television broadcasts using the same system. ICE has a link to an in-flight email server which allows passengers to access, send or receive emails for US$1 per message. ICE also supports a seat-to-seat chat service. In November 2006 the airline signed a deal with mobile communications firm AeroMobile to allow in-flight use of mobile phones to call or text people on the ground, from some 777s. The service was first introduced in March 2008. The ICE system includes movies, music, and video games. ICE offers over 600 on-demand movie titles, over 2000 video on demand and prerecorded television channels, over 1000 hours of music and over 100 video-game titles. ICE can be accessed in more than 40 languages including English, French, German, Russian, Spanish, Arabic, Korean, Tamil, Thai, Italian and Japanese. Since 2003 all entertainment options are available on demand to all classes with options to pause, forward, and rewind them. The entertainment selections do not include LGBT-themed options. Emirates began to offer docking capability for Apple Inc.'s iPod portable music and video player in mid-2007. This allows the device's battery to be charged, and integrates with Emirates' in-flight entertainment (IFE) system. The IFE system can play music, television shows, or movies stored on the iPod, and function as a control system. Passengers may check-in between two and 24 hours prior to at Dubai International Airport, as well as at certain stations of the Dubai Metro. First and business class passengers, and Skywards Platinum and Gold members have access to 33 Emirates lounges in 32 cities. Skywards Silver members can use the lounges at Dubai Airport only. At airports in which Emirates does not operate a departure lounge, a third-party departure lounge is usually provided for First and Business class passengers and Skywards Platinum and Gold members. Complimentary chauffeur driven airport transfers are available to Business and First Class passengers in over 60 cities. It was known that Emirates used Volvo V70 wagons for Business Class passengers and Mercedes Benz E-Class cars for First Class passengers in Dubai, however, as of March 2017, Emirates has upgraded its fleet of cars for Business Class passengers to brand new BMW 5 Series touring cars. The type of vehicle varies depending on the location and service provider that the airline has signed a contract with in that area. Emirates Skywards is the frequent-flyer program of Emirates launched in the year 2000. The program had over 16 million members as of 2016. The program uses two separate points systems – Skywards Miles as the currency that can be redeemed for benefits, and Tier Miles as the metric that determines a member’s tier status. There are four tiers – Blue, Silver, Gold and Platinum. Once any customer registers, he or she becomes a Blue member. This registration is free of any charges. Silver tier requires 25,000 Tier Miles, Gold tier requires 50,000 Tier Miles and Platinum tier requires 150,000 Tier Miles for qualification respectively. Emirates Skywards has partners across airlines, banks, hotels, car rentals and retail/lifestyle verticals. As of 2016 Emirates has frequent-flyer partnerships with: Alaska Airlines, easyJet, Japan Airlines, Jet Airways, JetBlue, Jetstar, Korean Air, Malaysia Airlines, Qantas, S7 Airlines, South African Airways, TAP Portugal, Virgin America, Air Mauritius and GOL. Emirates Skywards has partnered with Starwood Preferred Guest (also known as SPG, the loyalty program of Starwood Hotels and Resorts) to bring its members Your World Rewards. This allows Emirates Skywards members to earn both Skywards Miles and Starpoints (the loyalty currency for SPG program) when they either fly with Emirates to over 150 destinations or stay at any of SPG’s 1,200 Starwood Hotels and Resorts. Another noteworthy partnership is Emirates Skywards partnership with Dubai Duty Free (DDF) which was launched in 2016. This partnership allows members to spend their Skywards Miles at participating Dubai Duty Free outlets when they travel through Dubai airports. Members can redeem their Skywards Miles for duty-free products at Dubai International airport and Al Maktoum International at Dubai South. Redemptions start from 4,500 Skywards Miles (worth AED 100), and members can instantly redeem Skywards Miles at the checkout. Each additional Dirham (AED) is equivalent to 45 Skywards Miles, and there is no upper limit to the number of Skywards Miles that can be spent. From 28 August 2016, Emirates Skywards enabled its members to use Miles or a combination of Cash+Miles (C+M) to pay for an EK published fare as a form of payment. This benefit allows members to redeem a minimum of 2000 Skywards Miles and a maximum of total amount of base fare in Skywards Miles. Cash+Miles is used as a form of payment for the base fare only and excludes taxes and carrier imposed charges. This benefit is available on Emirates flights only and not available on any other airlines with which Emirates has a codeshare agreement. Cash+Miles offers Emirates Skywards members more choice and flexibility when it comes to spending their Skywards Miles. This is available in all classes and is applicable to all fare types. The established network carriers in Europe and Australia, i.e. Air France-KLM, British Airways, Lufthansa, and Qantas, perceive Emirates' strategic decision to reposition itself as a global carrier as a major threat because it enables air travellers to bypass traditional airline hubs such as London-Heathrow, Paris-CDG, and Frankfurt on their way between Europe/North America and Asia/Australia by changing flights in Dubai instead. These carriers also find it difficult to deal with the growing competitive threat Emirates poses to their business because of their much higher cost base. Some of these carriers, notably Air France and Qantas, have accused Emirates of receiving hidden state subsidies and of maintaining too cozy a relationship with Dubai's airport authority and its aviation authority, both of which are also wholly state-owned entities that share the same government owner with the airline. Qantas' chairman claimed that Emirates is able to reduce its borrowing costs below market rates by taking advantage of its government shareholders' sovereign borrower status. Emirates' president disagrees and has also referred to United States airlines bankruptcy protection as being a substantial form of state assistance. The airline makes regular profits. In 2016, American Airlines, Delta Airlines, and United Airlines have made similar claims as well as stating that they violate Open Skies but these conflicts were resolved in May 2018. In May 2010, Emirates Airline executives refuted claims that the carrier does not pay taxes and receives substantial financial assistance from the Dubai government. They claimed that the airline received $80m in cash and kind in the 25 years since the airline was established and this was substantially lower than what other national carriers had received. Maurice Flanagan also claimed that Emirates incurred social costs of around $600m in 2009 and this included municipal taxes to the city of Dubai. The airline also paid a dividend of AED956m ($260m) in 2010, compared to AED2.9bn ($793m) in 2009 and each year the Government has received at least $100m in dividends. Emirates also faces competition from other UAE-based airlines, Etihad Airways of Abu Dhabi and the low-budget Air Arabia of Sharjah, as well as Qatar Airways of Qatar. On 9 April 2004, Emirates Flight 764, an Airbus A340-300 operating a flight from Johannesburg to Dubai sustained serious damage during takeoff when it failed to become airborne before the end of the runway, striking 25 approach lights, causing four tires to burst which in turn threw debris into various parts of the aircraft, ultimately damaging the flap drive mechanism. This rendered the flaps immovable in the takeoff position. The aircraft returned for an emergency landing during which the normal braking system failed as a result of the damage. The aircraft was brought to a stop only 250 meters from the end of the 3,400 meter runway using reverse thrust and the alternative braking system. In their report, South African investigators found that the captain had used a wrong take-off technique, and criticized Emirates training and rostering practices. On 20 March 2009, Emirates Flight 407, an Airbus A340-500 registered A6-ERG en route from Melbourne to Dubai failed to take off properly at Melbourne Airport, hitting several structures at the end of the runway before eventually climbing enough to return to the airport for a safe landing. There were no injuries, but the incident was severe enough to be classified as an accident by the Australian Transport Safety Bureau. On 3 August 2016, Emirates Flight 521, a Boeing 777-300 registered A6-EMW arriving from Trivandrum International Airport (ICAO:VOTV), crash-landed and caught fire at Dubai International Airport(ICAO:OMDB) at 12:44 PM local time. All 282 passengers and 18 crew on board survived the impact with some having minor injuries. However, an airport firefighter died fighting the blaze. The aircraft was destroyed by the fire. Flight 521 was the first hull loss in the history of Emirates.The aircraft was cleared to land on runway 12L at Dubai international airport.The initial impact of the aft lower aircraft fuselage of the aircraft caused surface damage to the runway at two areas abeam taxiway November 12.The runway surface was scored as the aircraft and engine cowlings slid along it.As it began to turn right,it impacted 7 taxiway guidance boards, 4 taxiway centerline lights,3 taxiway edge lights, 2 runway centre lights and 3 touchdown zone lights. A Emirates moved its operations to its dedicated Terminal 3 at Dubai International Airport on 14 October 2008. B The number of destinations does not include cargo-only destinations. C The Emirates Group does not publish figures separately for Emirates SkyCargo or Emirates, both companies' financial results are aggregated. ^ a b c d "Emirates Group announces half-year performance for 2018-19". Emirates.com. 15 November 2018. ^ "Gulfnews: Emirates is now seventh biggest airline". Archive.gulfnews.com. 10 November 2007. Archived from the original on 22 May 2009. Retrieved 15 July 2009. ^ "Emirates aircraft cover 432 million kilometres across the globe in six months". Emirates.com. 2016-07-28. Retrieved 2018-01-18. ^ "Emirates SkyCargo". The Emirates Group. Retrieved 26 August 2009. ^ "Domestic bliss - The world's largest airlines". Economist.com. 2015-06-24. Retrieved 2018-01-18. ^ "Emirates Announces 2009 Expansion Plan" (Press release). Emirates (airline). 18 February 2009. Archived from the original on 25 July 2011. Retrieved 3 August 2010. ^ "Emirates Executive". Emirates Executive. Retrieved 2018-02-22. ^ UAEinteract.com (31 December 2008). "Emirates and Dnata now under ICD UAE". Uaeinteract.com. Archived from the original on 25 May 2009. Retrieved 15 July 2009. ^ "Emirates and Dnata now under ICD". Gulfnews. Archived from the original on 3 January 2013. Retrieved 15 July 2009. ^ "Dubai moves ownership of Emirates, Dnata to ICD – Transportation". ArabianBusiness.com. 31 December 2008. Retrieved 15 July 2009. ^ "Emirates Airline 2014 Net Profit Jumps 40% On Lower Oil Price". Gulf Business. ^ "The Emirates Group". Emirates. 3 January 2011. Retrieved 3 January 2011. ^ "Company Overview". The Emirates Group. 9 July 2009. Retrieved 15 July 2009. ^ Emirates Group net profit surges to $1.1 billion. gulfnews. Retrieved on 28 November 2010. ^ "Emirates Revenue 2007–2009" (PDF). Archived from the original (PDF) on 15 December 2010. Retrieved 5 March 2011. ^ "Welcome from our Chairman | The Environment | About". Emirates. 16 June 2009. Retrieved 15 July 2009. ^ "About Emirates | The Environment | A380 environmental facts". Emirates. 5 August 2008. Retrieved 15 July 2009. ^ "Business: Good week – Bad week". Retrieved 10 November 2010. ^ "How we fly our planes | The Environment | About". Emirates. 1 July 2009. Retrieved 15 July 2009. ^ Alexander Cornwell; Staff Reporter. "Emirates Group profits up 34 per cent". Archived from the original on 25 June 2017. Retrieved 26 December 2018. ^ "Dubai's Emirates Group records 27th consecutive year of profit". Arabian Business. ^ "Emirates Group posts Dh5.5bn annual profit, 2nd highest in its history". Emirates 24-7. ^ "Scheduled Passengers Carried". Iata.org. Archived from the original on 23 March 2010. Retrieved 5 March 2011. ^ "Scheduled Passenger – Kilometres Flown". Iata.org. Archived from the original on 4 November 2013. Retrieved 5 March 2011. ^ "Scheduled Freight Tonne – Kilometres". Iata.org. Archived from the original on 30 January 2010. Retrieved 5 March 2011. ^ "From Modest Beginnings: The Growth of Civil Aviation in the Middle East". Journal of Middle Eastern Politics and Policy. ^ "Annual Reports | The Emirates Group". Ekgroup.com. 9 July 2009. Retrieved 15 July 2009. ^ "Annual Report 2010-2011". 10 May 2011. Retrieved 10 May 2011. ^ "About Emirates | Emirates Advertising". Emirates. 3 June 2008. Retrieved 15 July 2009. ^ "Tailored for New Era | Emirates | About Emirates | News". Emirates. 16 June 2008. Archived from the original on 25 February 2012. Retrieved 15 July 2009. ^ "Updated livery is revealed by Emirates-15/11/1999-Flight Daily News". Flight International. 15 November 1999. Retrieved 15 July 2009. ^ "Cricket Australia | Sponsorships | About". Emirates. 10 February 2009. Retrieved 15 July 2009. ^ "Lord's Taverners | Sponsorships | About". Emirates. 25 March 2009. Retrieved 15 July 2009. ^ "Pro Arch Tournament | Sponsorships | About". Emirates. 25 March 2009. Retrieved 15 July 2009. ^ "ICC Umpires | Sponsorships | About". Emirates. 10 February 2009. Retrieved 15 July 2009. ^ "Emirates secures major international cricket sponsorship – Brand Republic News". Brand Republic. Retrieved 15 July 2009. ^ Sambidge, Andy (19 May 2015). "Emirates adds Benfica to sports sponsorship portfolio". Arabian Business. Retrieved 19 May 2015. Emirates Airline on Tuesday announced a three-year shirt sponsorship agreement with Portugal’s most successful football club, Sport Lisboa e Benfica (Benfica). ^ Association, The Scottish Football. "The Scottish Football Association". www.scottishjuniorfa.com. ^ "Press Release - Emirates Airline US Open Series". Archived from the original on 2 April 2015. Retrieved 24 April 2015. ^ "Emirates Airlines featuring Jennifer Aniston !". YouTube. 2015-10-05. Retrieved 2018-01-18. ^ "YouTube". YouTube. Retrieved 2018-01-18. ^ "Emirates – Our Destinations". Emirates.com. 2015. Retrieved 23 May 2015. ^ Heasley, Andrew (1 November 2010). "Lone Emirates still flying high on luxury". The Age. Melbourne. Retrieved 10 November 2010. ^ "With which airlines does Emirates operate Codeshare flights?". Emirates. ^ "No women no fly: Twitter tackles Tunisia-Emirates spat". www.aljazeera.com. ^ "Emirates Forges Codeshare Partnership with China Southern Airlines". www.emirates.com. Retrieved 1 February 2019. ^ Liu, Jim. "Emirates / flydubai schedules codeshare launch in late-Oct 2017". Routesonline. ^ Liu, Jim (30 May 2018). "Emirates expands S7 Airlines Russia codeshare from May 2018". Routesonline. Retrieved 30 May 2018. ^ "Emirates e Trenitalia con un solo biglietto" [Emirates and Trenitalia with just one ticket]. LaStampa.it (in Italian). 1 August 2018. Retrieved 26 August 2018. ^ "Emirates SkyCargo". Skycargo.com. Retrieved 21 July 2013. ^ "Emirates VIP charter". Flightglobal.com. Retrieved 6 August 2013. ^ "Emirates fleet". airfleets.net. Retrieved 12 November 2017. ^ "Airbus ORDERS & DELIVERIES". Airbus. Retrieved 12 November 2017. ^ "777 Model Summary". Boeing. October 2017. Retrieved 12 November 2017. ^ Shweta Jain (October 4, 2017). "Emirates will be first airline to receive 777X, says Boeing". Gulf News Aviation. ^ "Emirates places US$15.1 billion order for 40 Boeing 787 Dreamliners at 2017 Dubai Airshow". www.emirates.com. Retrieved 2019-03-10. ^ "A380 Private Suites | Emirates A380 First Class | The Emirates A380 | Our Fleet | Flying with". Emirates. 2 June 2009. Retrieved 15 July 2009. ^ "A380 Shower Spa | Emirates A380 First Class | The Emirates A380 | Our Fleet | Flying with". Emirates. 2 June 2009. Retrieved 15 July 2009. ^ "A380 First Class Social Area & onboard Lounge | Emirates A380 First Class | The Emirates A380 | Our Fleet | Flying with". Emirates. 2 June 2009. Retrieved 15 July 2009. ^ "Emirates First Class Cabins inspired by Mercedes-Benz S-Class - Boeing 777". Beyondbusinesstravel.com. 2017-11-28. Retrieved 2018-01-18. ^ "Emirates' new Boeing 777 first class suites: what we know so far - Australian Business Traveller". Ausbt.com.au. Retrieved 2018-01-18. ^ 12 Nov 2017 by Tom Otley (2017-11-12). "Emirates reveals new cabins for Boeing B777 fleet - Business Traveller – The leading magazine for frequent flyers". Businesstraveller.com. Retrieved 2018-01-18. ^ "Emirates hints at design of new A380 first class suites". Australian Business Traveller. Retrieved 2017-04-06. ^ a b "A380 Flat Beds | Emirates A380 Business Class | The Emirates A380 | Our Fleet | Flying with". Emirates. 2 June 2009. Retrieved 15 July 2009. ^ "Emirates A380 Seating Plan". airreview.com. Retrieved 11 January 2012. ^ "Flying with Emirates | Cabin Features | Economy Class | New Generation Economy Seating". Emirates. 6 February 2008. Retrieved 15 July 2009. ^ "A380 New Generation Seating | Emirates A380 Economy Class | The Emirates A380 | Our Fleet | Flying with". Emirates. 2 June 2009. Retrieved 15 July 2009. ^ "A380 Entertainment | Emirates A380 Economy Class | The Emirates A380 | Our Fleet | Flying with". Emirates. 2 June 2009. Retrieved 15 July 2009. ^ Emily Manthei; Demand Media. 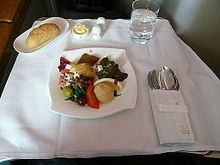 "Types of Meals on Emirates Airline". Travel Tips - USA Today. Retrieved 24 April 2015. ^ "Book flights with Virgin Atlantic" (PDF). Virgin-atlantic.com. Retrieved 2018-01-18. ^ "Arabian Aerospace - Emirates upgrades IFE system and raises the bar with ICE". Retrieved 24 April 2015. ^ "ice | Entretenimiento a bordo | Su viaje comienza aquí". España. ^ "Emirates A380 superjumbo plane". Sydney Morning Herald. Retrieved 15 July 2009. ^ "Helps Develop New Subtitle Technology For Inflight Entertainment System | Emirates | About Emirates | News". Emirates. 31 October 2007. Archived from the original on 29 September 2011. Retrieved 15 July 2009. ^ "Singapore Airlines and Connexion by Boeing Finalize Plans for High-Speed, In-Flight Connectivity". Boeing. 2 December 2004. Archived from the original on 1 November 2007. ^ "Mobile calls on Emirates flights". BBC. 20 March 2008. Retrieved 22 March 2008. ^ Emirates Traveler Information Archived 27 October 2007 at the Wayback Machine Emirates, Wednesday 11 April 2007. ^ "Terms & Conditions | Book your Dubai Stopover now | Dubai Stopovers | Destinations & Offers". Emirates. 1 November 2008. Retrieved 15 July 2009. ^ "Annual Report 2011-12". Emirates.com. 5 October 2012. Retrieved 5 October 2012. 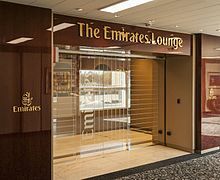 ^ "Emirates Worldwide Lounges". Emirates.com. 20 December 2011. Archived from the original on 5 January 2012. Retrieved 13 January 2012. ^ "Chauffeur-drive | The Emirates Experience | Emirates". Emirates. Retrieved 2017-05-02. ^ "History | About Emirates | Emirates". Emirates. Retrieved 2017-02-20. ^ "Skywards | Emirates Airline". Emirates Airline. Retrieved 2017-02-20. ^ "Our Partners | Emirates Skywards | Emirates". Emirates. Retrieved 2017-02-20. ^ "See more world with Cash+Miles | Emirates Skywards | Emirates". Emirates. Retrieved 2017-02-20. ^ "Europe's flag carriers attack Emirates' expansion, Canada blocks UAE airlines and dispute escalates | Centre for Asia Pacific Aviation – CAPA". Centreforaviation.com. Retrieved 13 January 2012. ^ Middle East airlines change the kangaroo route-20 September 2007. Travelmole.com. Retrieved on 28 November 2010. ^ McGinley, Shane (12 May 2010). "Top Emirates exec slams gov't protection claims". Arabian Business. Retrieved 7 July 2010. ^ "UAE passes 70 million passengers; Emirates, Etihad and Air Arabia networks continue to grow". anna.aero. Retrieved 17 February 2013. ^ "ASN Aircraft accident Airbus A340 A6-ERN". Aviation Safety Network. Retrieved 18 December 2011. ^ David Learmount (11 January 2006). "Emirates censured in Airbus A340 Johannesburg runway overrun probe". Flightglobal. Retrieved 18 December 2011. ^ Noah Browning (3 August 2016). "Emirates Airline flight crash-lands at Dubai airport: Government". Reuters. Retrieved 3 August 2016. ^ "Plane makes emergency landing at Dubai International Airport". Gulf News. Al Nasir Publisions. 3 August 2016. Retrieved 3 August 2016. ^ "Plane crash-lands at Dubai airport". 3 August 2016 – via www.bbc.com. This page is based on the Wikipedia article Emirates (airline); it is used under the Creative Commons Attribution-ShareAlike 3.0 Unported License (CC-BY-SA). You may redistribute it, verbatim or modified, providing that you comply with the terms of the CC-BY-SA.